Alison Edwards and David Edwards (Rotary Club of Kapiti)’. The people of Kapiti respond in generous style annually to an appeal for assistance with foodstocks for the local Kapiti Foodbank. This is achieved through collectors manning doors at eight supermarket sites, and requesting shoppers to buy something extra for donation on leaving the premises. Collection points at Paraparaumu and Waikanae are supervised by over forty personnel from the Kapiti and Waikanae Clubs, and assisted by Inner Wheel. The overall arrangements are coordinated by David Edwards of the Kapiti Club, who has been on the job for over 8 years. Every year has resulted in an increase in food collection and cash for the local Foodbank. The recently held 2015 appeal has amassed over 300 banana boxes full of a wide variety of tinned foods, breakfast articles, and toiletries, as well as over $2000 in cash donations. Local schools and other organisations also assist throughout the year with collections. 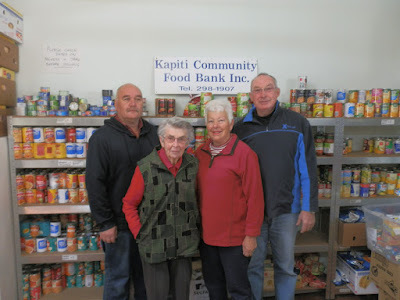 The Kapiti Foodbank Trust is run by volunteers, and the people who are supplied with food parcels are generally referred by WINZ and local churches. Applicants are carefully assessed for genuine need by the trained volunteers. David Edwards is ably assisted by his wife Alison in this annual promotion. They enjoy seeing the results that keep needy people healthy in times of adversity. This activity has been emulated in other Districts throughout New Zealand, and it is a tangible demonstration of Rotary in action at local level.